kitchen countertops have a major impact on the overall aesthetics of a kitchen. Kitchen countertops must be tough enough to withstand constant use, while at the same time maintaining a beautiful and clean appearance. There are scores of options available in kitchen countertops, but before making a choice, several factors need to be considered, the most important being durability. Other considerations include water and heat resistance, maintenance, and ease of cleaning, as well as the cost of installation. quartz — Also referred to as engineered stone, quartz countertops are made from a combination of natural quartz, binders and resin pigments. This makes them extremely strong while maintaining the appearance of real stone. These high-quality countertops are extremely hygienic and a cinch to keep clean. They also stand up exceptionally well to heat, and are scratch and crack-resistant. If you're looking for kitchen countertops that look like natural stone but have a more uniform color, quartz is ideal. Quartz countertops could offer an enduring, timeless beauty to spaces. When neutral colors are used as a base color concept, you can transform your kitchen into a modern indoor sanctuary. Low Maintenance: Countertops materials should be low maintenance and beautiful. Unlike natural stone, such as marble or granite, quartz needs no maintenance beyond daily wiping with household detergent. If you want extra shine after cleaning your quartz kitchen countertops, spray window cleaner on the surfaces and wipe dry with a paper towel. This also reduces the amount of dust attracted. 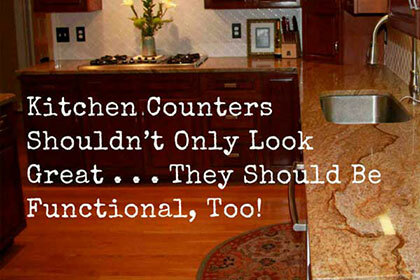 Scratch Resistant: High-quality countertops must be durable and stand up well to constant use. Scratch-resistant quartz kitchen countertops will retain their smooth, cool polished finish for many years. However, take care not to expose them to excessive heat. Strength: Engineered stone is super strong, and yet it is significantly more flexible than granite, which means it's less prone to cracking and chipping. Stain Resistant: The quality of the manufacturing process ensures that quartz kitchen countertops are non-porous, so the surface is naturally resistant to stains. Natural stones like marble and granite are porous, which is why they need to be sealed.